There are a variety of popcorn brands to choose from, but last night I was feeling like getting something a little healthy and picked the only two brands offered at my local grocery store that didn’t have partially hydrogenated oil in it. So you have your Smart Balance (which I am a fan of their buttery spread) and Newman’s Own. This was okay, nothing too exciting. Just your average tasting popcorn. We felt it just barely had enough butter and salt to give it any flavor but of course it dd say “light butter” on the package so we weren’t expecting huge flavor anyway. There was an odd smell that I couldn’t really find words for but Ethan said it had a slight kettle corn quality scent when we first opened the bag. In the end we agreed that this popcorn was “acceptable”. Nothing great but not bad either. This was also light butter flavor but it tasted like no flavor and started to leave a waxy taste in my mouth after a couple of handfuls. I was surprised from the lack of flavor since their butter spread is so good, but Ethan and I both felt like it was just plain popcorn and it made Newman’s Own seem like it had movie theatre butter on it. We chose Newman’s Own because it had more detectable butter and salt. Which was very light but compared to Smart Balance it was just enough to taste like something and SB was void of any flavor, plus left that waxy film in my mouth so we wouldn’t get SB again. Smart Balance or Newman's Own? 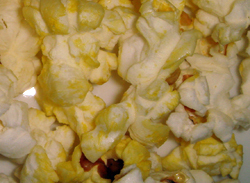 Blech, I can’t stand that waxy film feeling, which is why I usually avoid microwaved popcorn. Smart Balance is some of the worst popcorn I have ever had in my life. 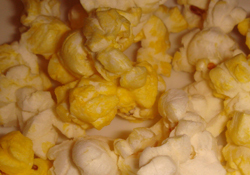 I LOVE popcorn and have had almost any kind you can think of. It takes a lot for me to reject popcorn, but I could not even finish eating the rest of the Smart Balance. The Newman’s Own looks nasty. I’m not a popcorn guy, but my wife and kids insist on Orville Redenbacher Light Butter. I brought home the Newman’s Own and it was declared inedible.